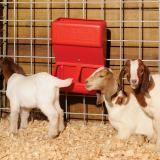 Proven indoor/outdoor small grain, pellets, salt or mineral feeder. They've worked well both for Premier and our customers. For orphan lambs & kids. Their stomachs are not able to thrive (or survive) on hay and grass until they are 10 weeks old. It's too expensive to feed milk replacer so long. The solution is grain, pellets and soybean meal. For thin or sick breeding animals requiring special attention. For salt or mineral—should be available free choice year-round. 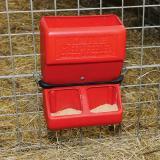 These feeders are ideal for supplying loose salt and salt/mineral mixes indoors. 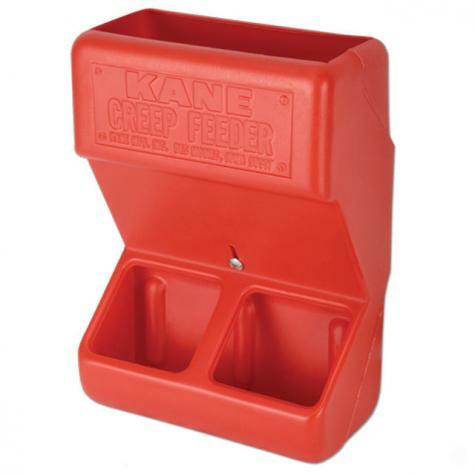 Kane feeders have male-female fittings to make installation and removal simple. 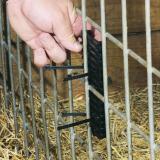 Fitting is a black triangular strip that screws to the wall and receives a strip attached to the back of the feeder. They make it easy to remove feeder for cleaning as needed. Salt or mineral: Should be available free choice year-round. 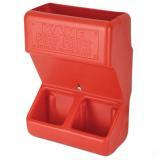 These feeders are ideal for supplying loose salt and salt/mineral mixes indoors. Recommended: 7 out of 9 said they would recommend this product to a friend. We bought two of these mineral feeders to feed our mill's loose salt and mineral blend to our flock of sheep, and they work great! My only reason for the four star rating rather than five is that the mounting system makes it too easy for the sheep to knock the feeder off the wall. This issue was easily remedied by placing a single screw into the board to which the feeder is mounted, just above the top of the feeder. 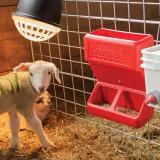 With the screw in place, when sheep bump the feeder upwards, the feeder hits the screw and drops back into place. We usually fill it in place, simply pouring the loose salt/mineral from a bucket, but the feeder is easily removed for filling or cleaning by backing out the screw. I also really like the ability to adjust the flow of mineral by moving the small panel inside the feeder and holding it in the desired position by tightening the wing nut. Overall, a really good product! Working well so far with my Boers and Lamanchas. 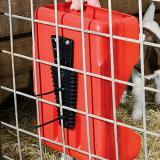 As previously mentioned, some kind of “stop” would be best to install so that the goats don’t push it off the holder. Making one that doubles as a hinged lid is recommended as well. My bucks like to push it off the holder when it’s empty and the Guineas in the barn can make a mess of the mineral inside if it’s not covered. The mineral level adjustment is a bit less than I’d like but it’s not terrible. All in all, it’s functional with some minor tweaks. Love the small size for creep feeding goats! However was disappointed there were no screws to hang it! Now I need to search for screws to fit! That's disappointing! This feeder is smaller than I anticipated. 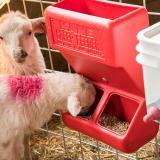 However, it is a perfect indoor free mineral feeder for my two ewes and a great creep feeder for our current 7 lambs. The bracket is good and secure. no trouble so far! !